At the invitation of the government of the Republic of Maldives, President Xi Jinping's Special Envoy and Minister of Culture and Tourism Luo Shugang will travel to the Maldives for the inauguration ceremony of new Maldivian President Ibrahim Mohamed Solih from November 15 to 19. Member of the Political Bureau of the CPC Central Committee, Member of the CPC Central Committee Secretariat, and Secretary of the Political and Legal Affairs Committee under the CPC Central Committee Guo Shengkun will travel to Russia for the 5th meeting of the China-Russia Law-enforcement and Security Cooperation Mechanism and visit Hungary upon invitation from November 14 to 19. Q: Can you confirm that Vice Premier Liu He and US Treasury Secretary Mnuchin spoke by telephone on Friday? Is it true that Vice Premier Liu He is preparing to go to Washington soon for more trade talks? A: What I can confirm for you is that not long ago, President Xi Jinping and President Trump had a telephone conversation, during which the two leaders agreed that the economic teams from the two countries should increase engagement and conduct consultations on issues of mutual concern so as to seek a solution that can be accepted by both sides on China-US trade issues. Regarding the specifics on the contacts between the economic teams from the two sides, I would like to refer you to the Commerce Ministry. Q: The Universal Periodic Review (UPR) Working Group of the UN Human Rights Council recently adopted China's report for its 3rd cycle of the UPR. What is your comment? A: Previously we briefed you on China's participation in the 3rd cycle of the UPR of the UN Human Rights Council. 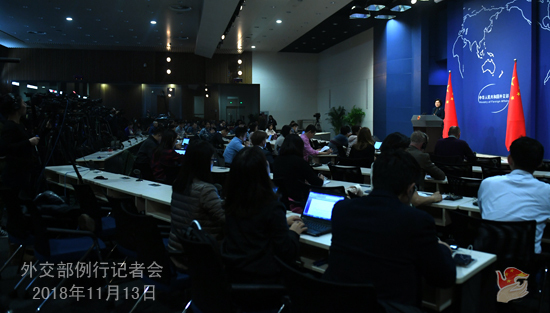 Vice Foreign Minister Le Yucheng and Assistant Foreign Minister Zhang Jun were interviewed separately by the media on this review. During this review cycle, the Chinese delegation submitted China's national report on human rights, gave a panoramic view of China's latest achievements and progress in the promotion and protection of human rights, and announced 30 new measures in the human rights field. The UN Human Rights Council session unanimously adopted China's UPR report on November 9 which records the recommendations raised by all parties during the review in an overall objective and balanced way and covers the fields of poverty eradication, law-based governance, innovation-driven development, employment promotion, livelihood enhancement, protection for special groups including women and children, religious affairs administration, counter-terrorism, climate change and sustainable development, South-South cooperation, human rights education, national human rights plan, rejection of double standards in human rights, and international human rights cooperation. China sets great store by the relevant recommendations in the UPR report and thanks the representatives of the vast majority of the participating countries in offering their positive comments, understanding and support. We will meticulously, responsibly and thoroughly study these recommendations and give our feedback at next year's Human Rights Council session when the UPR report will be approved. One thing I want to highlight in particular is that during this review, 150 UN member states signed up to speak, setting a record in the history of the UPR. More than 120 countries highly praised and fully recognized China's tremendous achievements in promoting and protecting human rights, and believed that China, as the country with the fastest development over the past 30 years, has written a vivid story of human rights promotion and also made important contributions to the cause of human rights in the world. 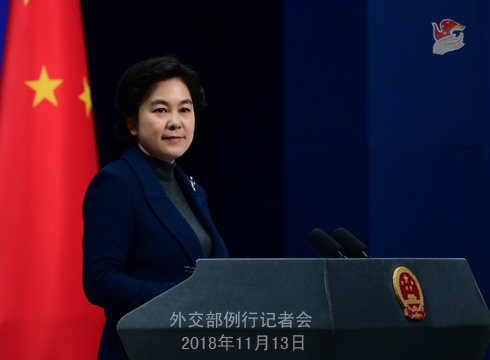 In their speeches, many countries supported China's choice of the development path which suits its own national conditions, appreciated China's important role in safeguarding the interests of the people of developing countries, supported the propositions on human rights put forward by China, and also expressed their willingness to strengthen exchanges with China and learn from each other to achieve common development. All these have fully proved that China's progress in the human rights field is tangible and the human rights development path that suits China's national conditions is completely correct. China's progress in human rights protection has made significant contributions to the world human rights cause. Before, after and during the review, however, some western countries sought to attack and discredit China with rhetoric purely based on political considerations and ideological prejudices instead of the facts. We urge the relevant countries to have an objective view of China and respect China's political system and development path chosen independently by its people. We firmly oppose and will never accept the use of human rights by any country or individual out of political motives to interfere in China's internal affairs and undermine China's sovereignty and territorial integrity. China will remain steadfast on its path of development that suits its national conditions. Q: Yesterday, China and Singapore inked the protocol on upgrading the China-Singapore Free Trade Agreement. What do you think is the significance of signing the document at this point? A: Yesterday, Premier Li Keqiang who is on a visit in Singapore and Singaporean Prime Minister Lee Hsien Loong witnessed the signing of the protocol on upgrading the China-Singapore Free Trade Agreement. The official from the Department of International Trade and Economic Affairs of the Ministry of Commerce has elaborated on that. Here I would like to stress the following three points. First, the signing of the protocol will further unleash the potential of bilateral economic and trade cooperation, add new dimensions to the China-Singapore all-round cooperative partnership progressing with the times and set a role model of equal and mutually beneficial cooperation between countries of starkly different economic sizes. Second, the protocol incorporated the cooperation on the Belt and Road Initiative for the first time, emphasizing that the Belt and Road Initiative is of great importance to deepening bilateral cooperation across the board, achieving the goal of common development, realizing and strengthening regional connectivity and promoting regional peace and development. It will help further elevate China-ASEAN Strategic Partnership and advance the regional economic integration of East Asia. Third, the signing of the protocol demonstrates the positive attitude and resolve of China and Singapore to firmly support free trade and economic globalization with concrete actions. We are willing to join hands with Singapore and other countries around the world to continue to uphold the multilateral trading system with the WTO at its center, promote trade and investment liberalization and facilitation, jointly advocate, practice and stay committed to openness and build an open world economy. Q: It is reported that Win Myat Aye, Myanmar's Minister for Social Welfare, Relief, and Resettlement, said on November 11 that Myanmar is ready to accept the relevant people from Bangladesh. Myanmar also issued a statement saying that China and other countries have offered necessary assistance to the repatriation process. What is your comment? 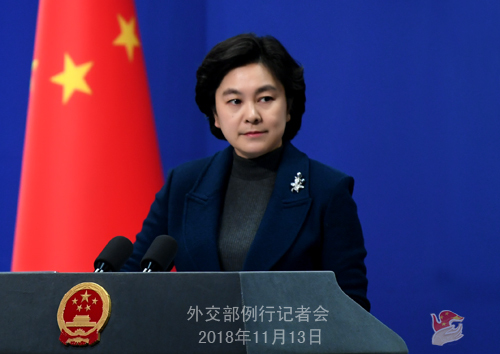 A: China welcomes the positive efforts and progress made by Myanmar and Bangladesh in resolving the Rakhine State issue. Both Myanmar and Bangladesh are China's friendly neighbors. China has been working on the two sides, encouraging them to properly resolve the Rakhine State issue through dialogue and consultation. You may all remember that State Councilor and Foreign Minister Wang Yi held informal meetings with Myanmar and Bangladesh in Beijing in June and in New York in September this year, during which important consensus was reached on properly resolving the Rakhine State issue. On November 9, when State Councilor and Foreign Minister Wang Yi met with Bangladesh Foreign Secretary Shahidul Haque in Beijing, the two sides exchanged views again on the repatriation of the displaced to the Rakhine State. We are glad to see that Myanmar and Bangladesh have made important progress in dealing with the Rakhine State issue and agreed to repatriate the first group of the displaced soon. This marks a good beginning for resolving such a complicated historical issue and will offer experience for the following repatriations. China believes that Myanmar and Bangladesh have the capability and wisdom to properly deal with this issue. We are certainly ready to offer more necessary support. I want to point out that the current situation is hard-won. We hope that the international community could cherish the positive progress made so far in resolving the Rakhine State issue and continue to assist in promoting dialogues between Myanmar and Bangladesh and settling practical problems. The UN special agency should play a constructive role in this regard. Q: We have noted that yesterday, the official from the State Council of China made a statement on China's decision to "lift the ban" on the sale and usage of rhino horns and tiger bones which has aroused attention from the international community, saying that the implementation of relevant rules will be postponed. Some people believe that this is a response to the criticism from the international community after the Chinese government issuing the relevant notice. What is your comment? A: It is the Chinese government's consistent position to strengthen protection for rhinos and tigers and all other endangered species in accordance with law. We hope that the relevant parties that are concerned about this issue can maintain communication and exchanges with the Chinese competent authority to ensure that rhinos and tigers can be better protected. As to the specifics you mentioned, I would like to refer you to the Chinese competent authority.